KariAnne has a great tutorial for dressing up your dinner rolls for Thanksgiving. 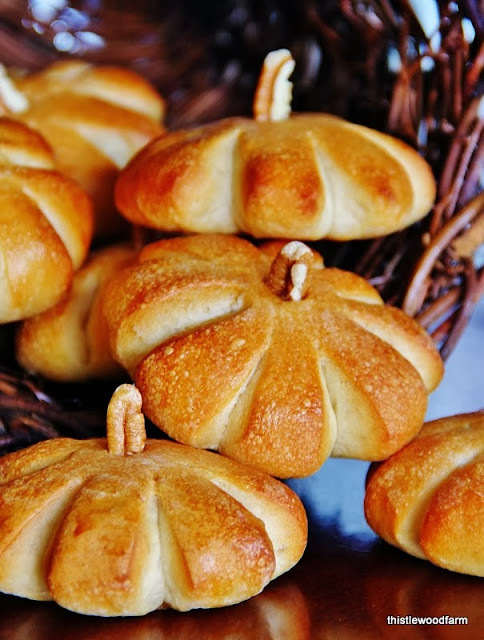 She used frozen rolls from the store to create these festive pumpkin shaped rolls. The tutorial is so easy that you could pull it off while watching the football game. Check out how to make pumpkin rolls over at Thistlewood Farm. How Darling, I just finished a post on my efforts of making bread. I want to add your post to it, if that's OK. Guess what maybe Snow Sunday..